The Benue State Executive Council presided over by Governor Samuel Ortom has approved free education for all institutionalized orphans in the state starting from Nursery, Primary and Secondary Schools. State Commissioner for Information and Orientation, Mr. Lawrence Onoja Junior, disclosed this today while briefing newsmen on the resolutions of the 10th exco for the year 2018. According to the commissioner, Exco arrived at the decision after deliberations on a memo brought to it by the state ministry of Women Affairs and Social Development. He stated that Exco further directed the Women Affairs and Social Development in conjunction with the state Ministry of Education, Science and Technology to work out modalities for the commencement of the programme in the 2018/2019 academic session. He also stated that the Benue State Government is to sign an agreement with Air Peace Limited to commence commercial flight operations in the state. Sequel to this, the state Commissioner for Works, Transport and Energy, Mr. Emmanuel Manger had been directed to facilitate all processes that would lead to the commencement of trial flight operations for a period of six months. Mr. Onoja also told newsmen during the briefing that Exco directed the state ministry of health and human services to move all medical officers on bond and their graded files to the Hospitals Management Board as their place of primary assignment. Also, TORRA KFT Hungary has been retained by Exco as core investor in the Mega Farms And Beverages Processing Company, Wannune and had subsequently been delisted from lists of companies earlier marked for privatization or lease by the state government. 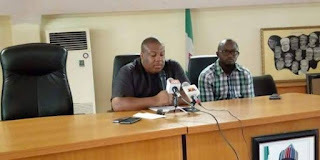 Meanwhile the Benue State Focal Person of the National Social Investment Programme, Mr. Terhide Utaan has been suspended by the state government, following a query issued him by the national headquarters of the programme. Dr. Terris Damsa, Senior Special Assistant to the Governor on Politics has been appointed in acting capacity pending the conclusion of investigations into the management of the programme under Mr. Utaan.